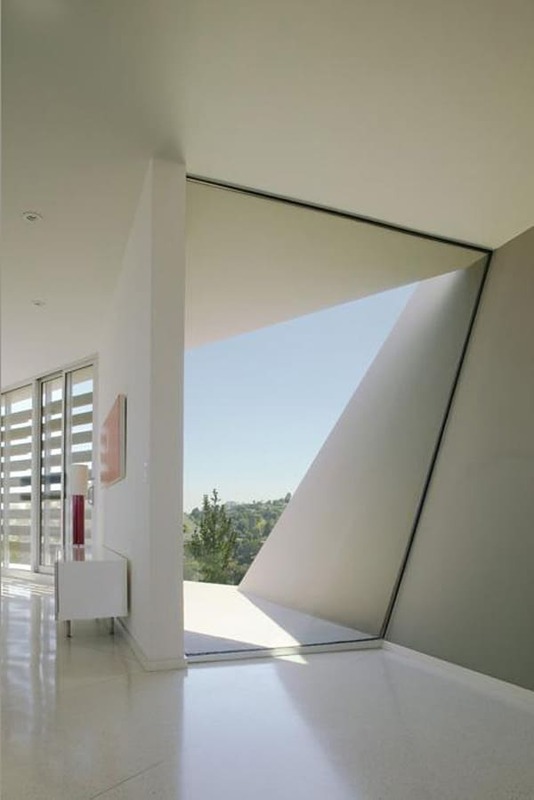 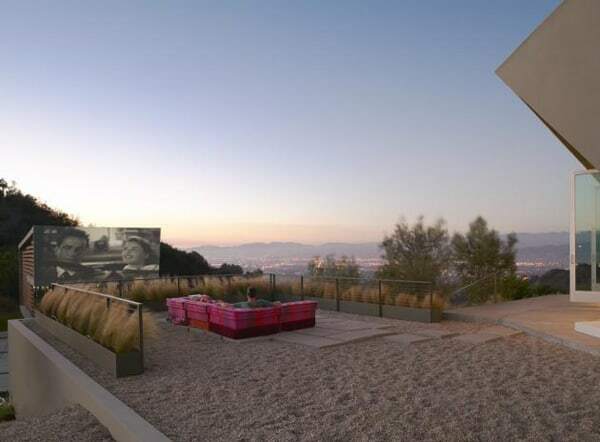 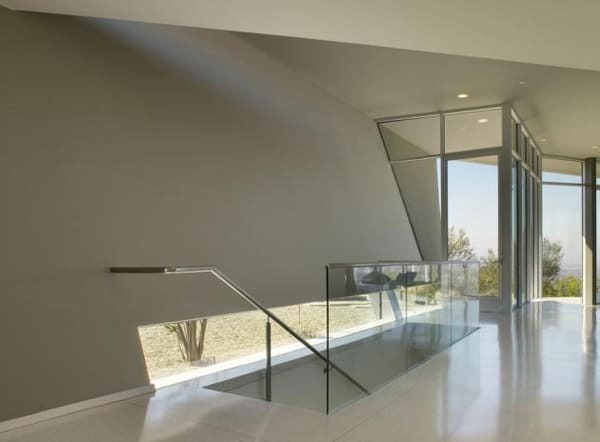 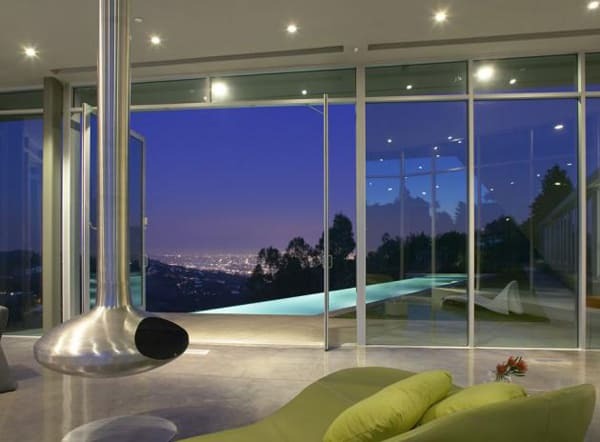 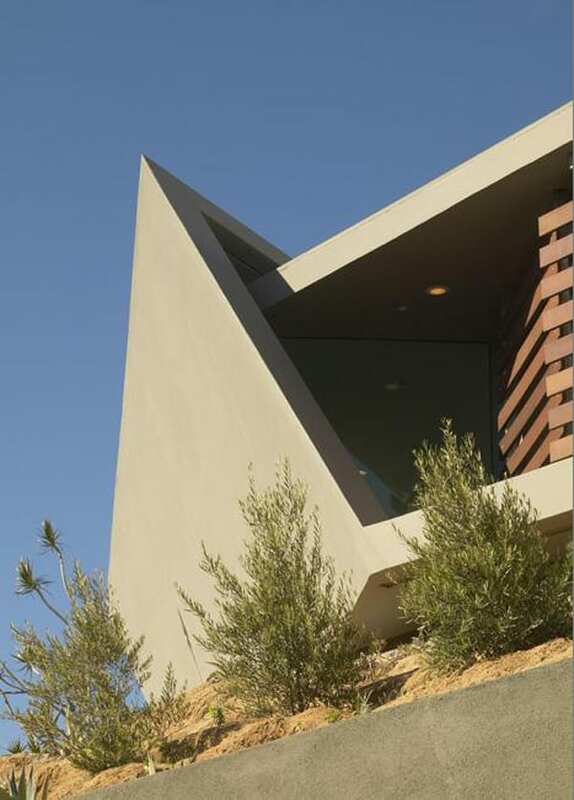 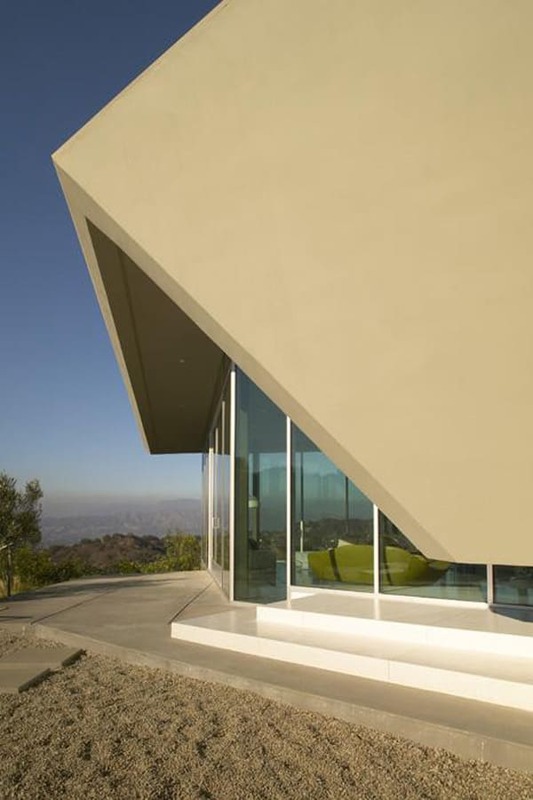 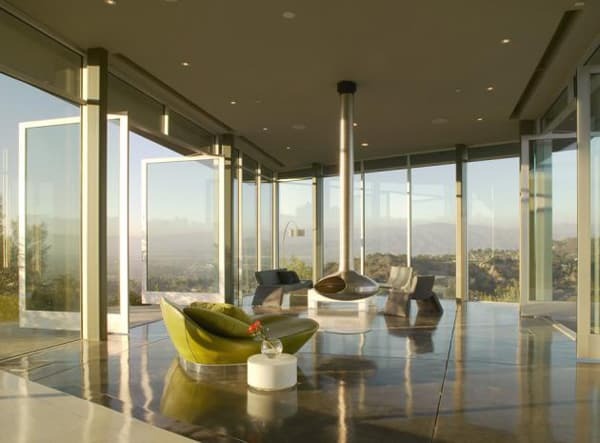 The Skyline Residence, designed by is located along a steep ridgeline in the Hollywood Hills of California. 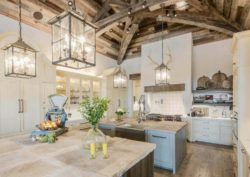 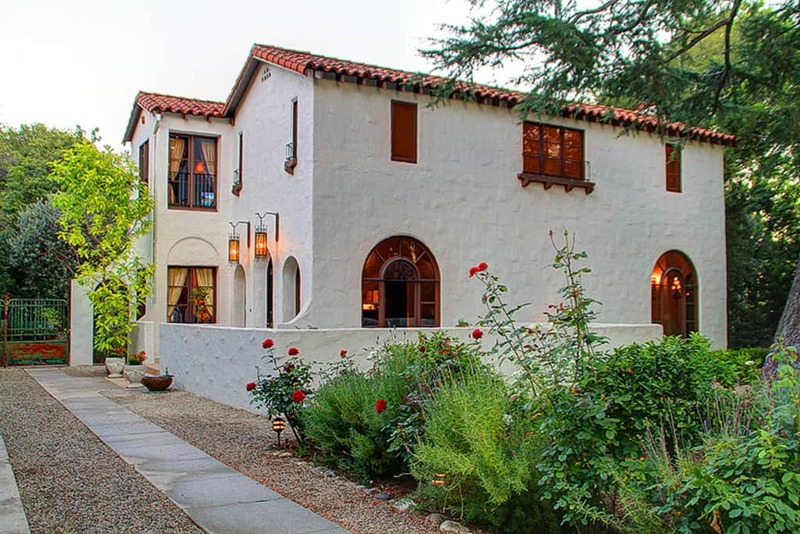 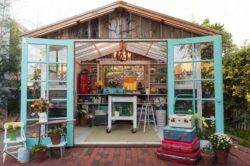 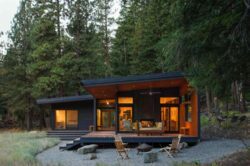 There were physical constraints that made it difficult to build on the property. 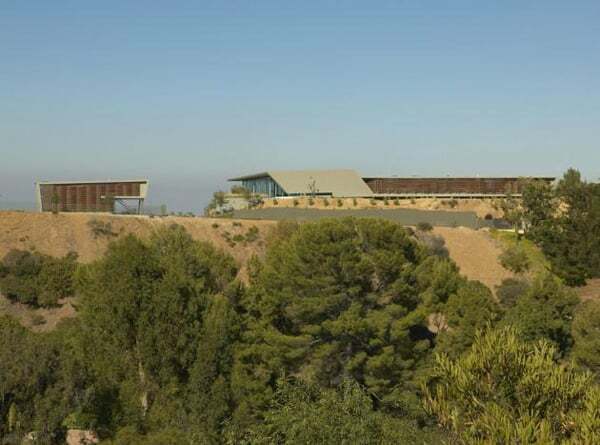 The plot’s narrow expanse of land abuts steep, brush-covered hillside on two sides, with an easement flanking the Southwestern edge. 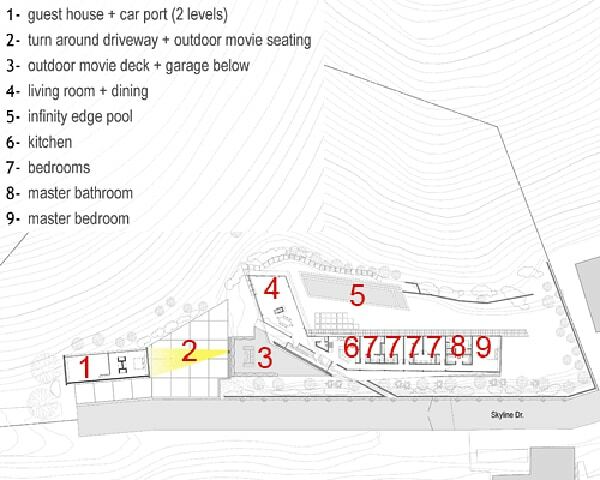 If that were not enough, part of the land sits on granite, making excavation difficult. 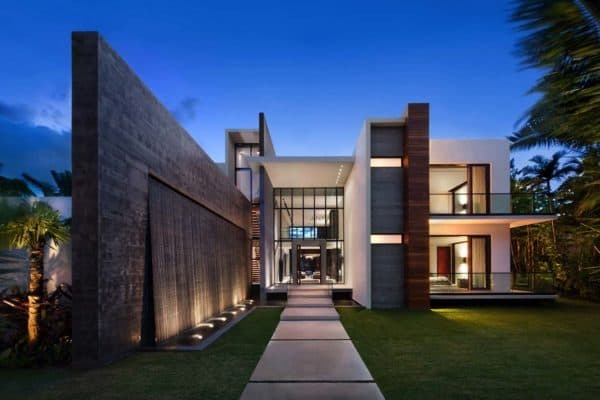 The architect decided that he needed to work with the land instead of fight it and create a narrow building that still maximizes views and sits lightly on the land with minimal to no grading. 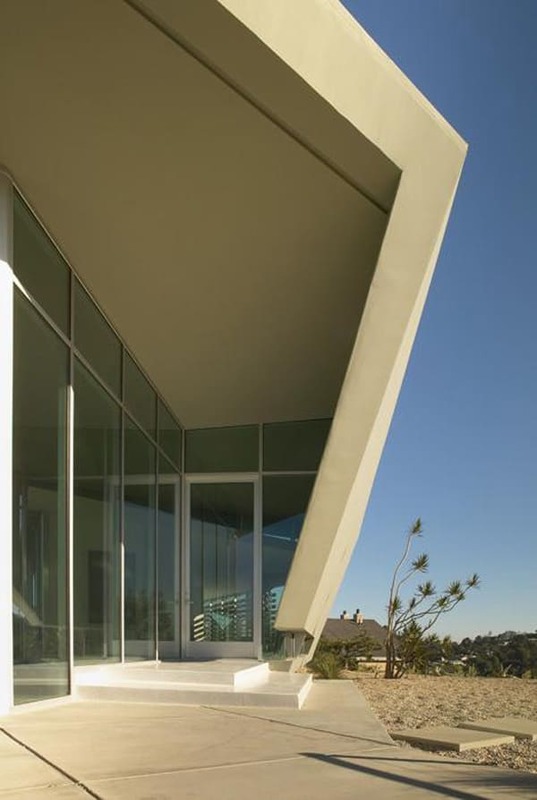 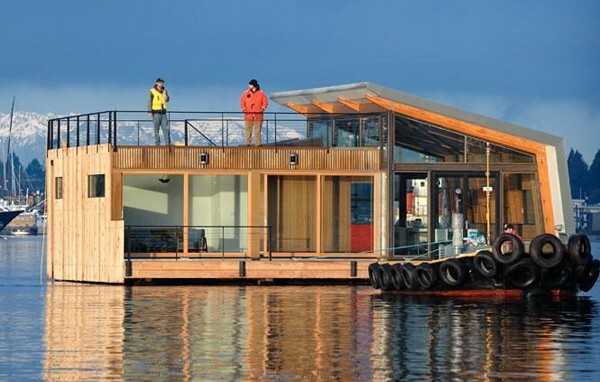 The resulting 5,200-square-foot residence and guesthouse is a linear structure 20-feet wide and 120-feet long, enclosed by a single, concrete folded surface with glazing and wood screened walls on the southern and eastern sides. 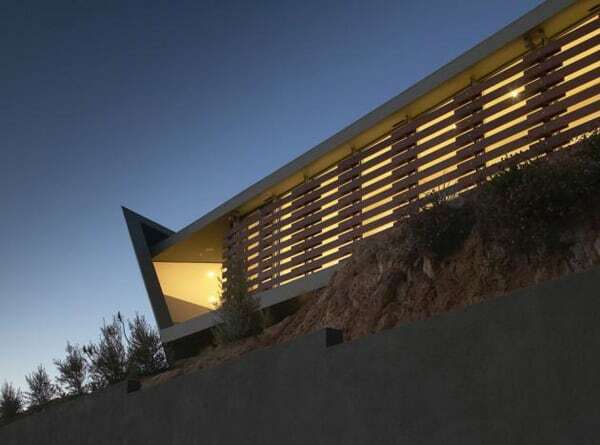 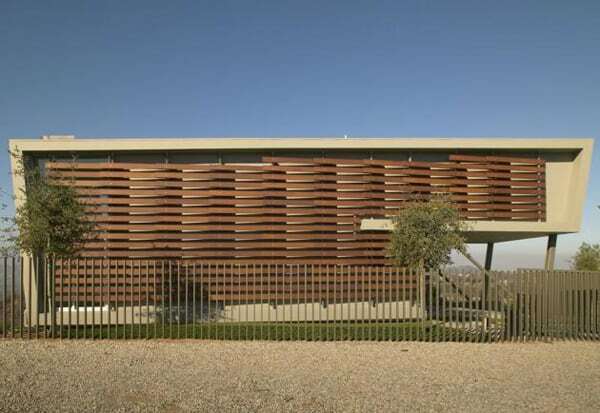 While the concrete envelope bends to conform to the top of the ridge where the sun is harshest, the screen, made of thin, pressure-treated recycled wood panels, keeps low evening sun from flooding the interiors. 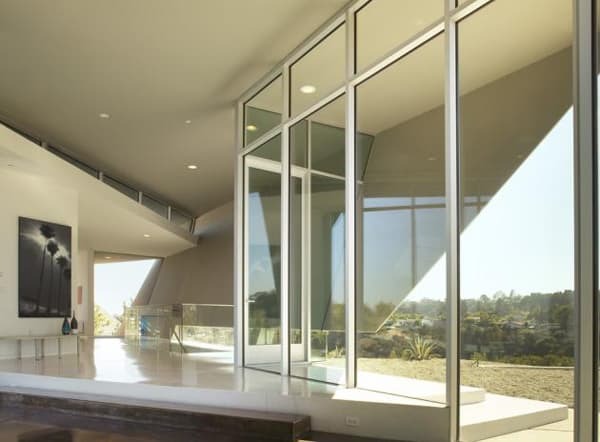 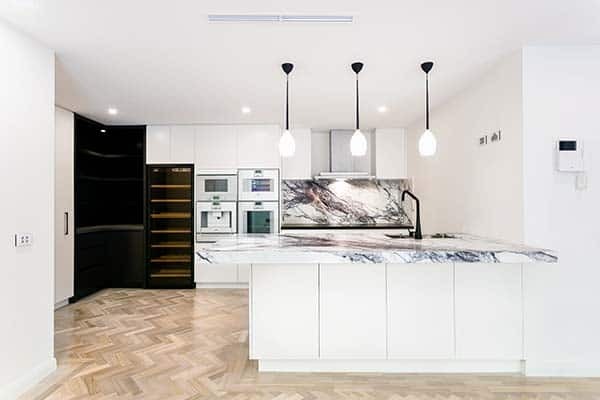 Four bedrooms and a study are located along a corridor, which terminates in an open kitchen, dining area, and dramatic living room with a Fireorb fireplace and floor-to-ceiling glass walls on three sides. 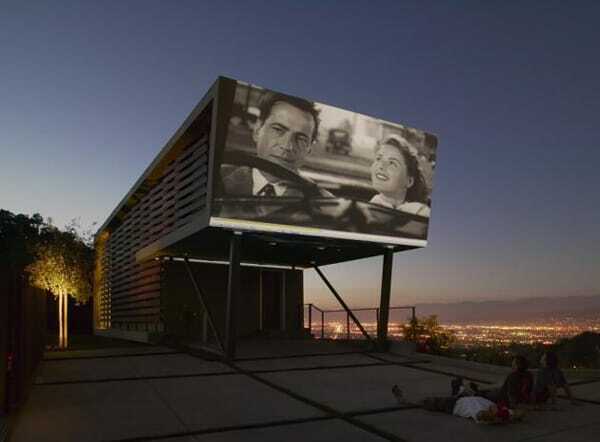 The living room opens to an outdoor movie deck (which sits atop the garage). 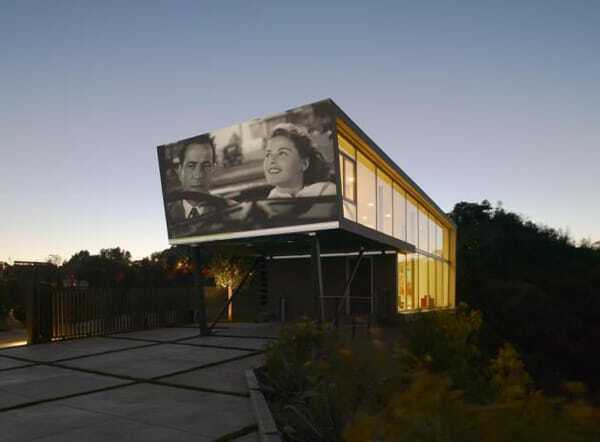 Films are projected onto the outer wall of the guesthouse. 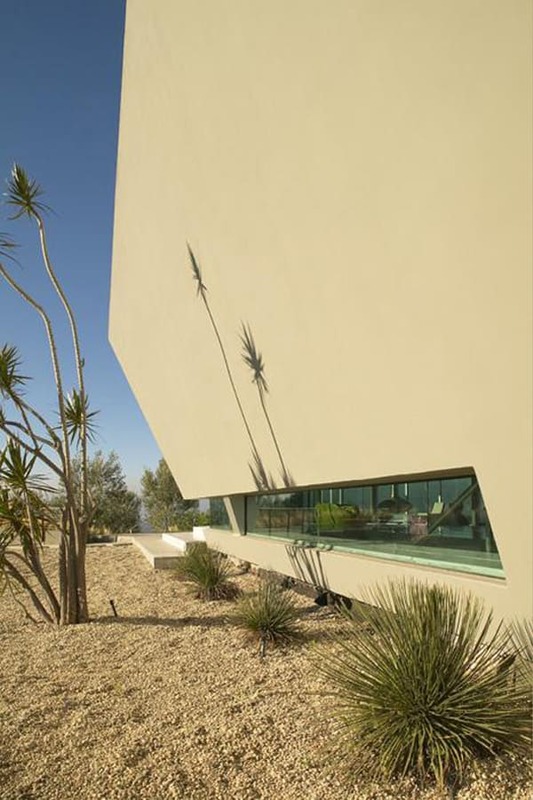 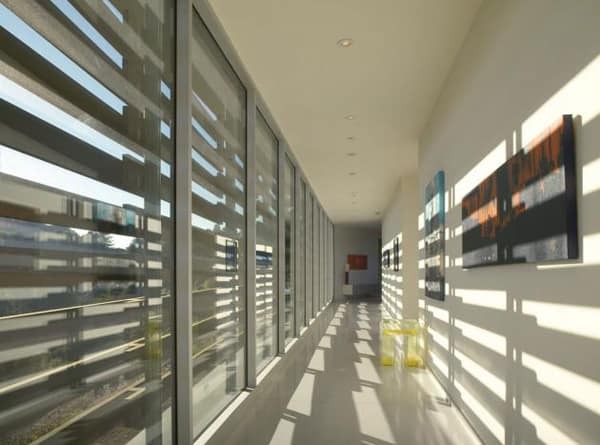 Visit the Belzberg Architects website .